As a foundation for transgastric NOTES, we aimed to develop an easy and fast method to create and close a gastrotomy without the use of endoluminal suturing devices. Four pigs, mean weight 36 kg, were used for this survival study. Pigs were anesthetized and received preoperative IV antibiotics. The stomach was endoscopically irrigated with saline, followed by 500 cc of 5% povidone-iodine. Then a sterile two channel endoscope was placed into the stomach. A gastrotomy site was chosen in the corpus along the greater curvature. Using a suture passer, a suture was introduced through the abdominal wall into the gastric lumen and passed to the endoscopic grasper. The suture passer was pulled back and reintroduced trough the same skin incision, to grab and pull out the suture again, creating a 1 cm full thickness bite of the stomach. A second suture was placed in a similar manner 2-3 cm caudal to the first suture. The stomach was punctured with the suture passer between the two sutures. A guidewire was introduced through the working channel of the endoscope and externalized with the suture passer. The gastric wall was stabilized with an endoscopic grasper next to the exit site of the guidewire and pulled back, while the floppy end of the guidewire was held externally at the abdominal wall. By further introducing the guidewire through the scope, it was forced to loop in the peritoneal cavity between the gastric and abdominal wall. A balloon dilatator was advanced over the guidewire through the gastric wall and was inflated to 20mm to create a gastrotomy. The endoscope was advanced into the peritoneal cavity over the guidewire and a NOTES procedure was performed. At the end of the procedure, the transfacial sutures were tied to the abdominal wall. One to three additional sutures were used to approximate the gastrotomy edges. Necropsy was performed at two weeks. Creation and closure of the gastrotomy was successfully performed in all animals. Mean time to create and to close the gastrotomy was 45 min (SD±16 min) and 20 min (SD±13min), respectively. At necropsy, no leaks were noted when the stomach was insufflated with air by endoscopy. In one pig, a 1 cm abscess was found at the gastrotomy site. 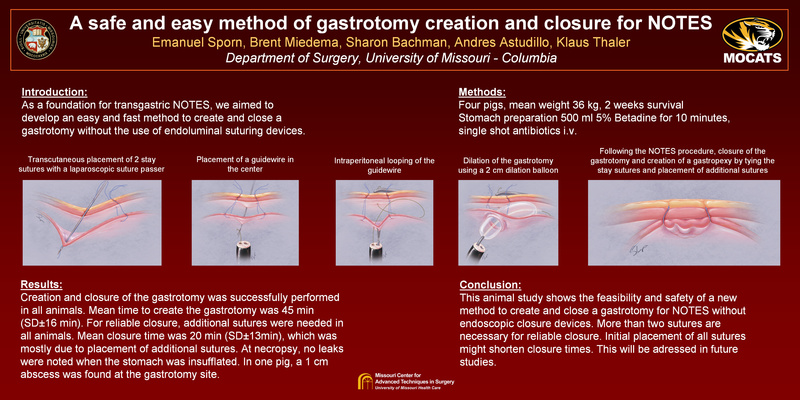 This animal study shows the feasibility and safety of a new method to create and close a gastrotomy for NOTES without endoscopic closure devices.